Used for many years as a drug delivery system, a troche is a small lozenge that simply dissolves between your gum and cheek. The medication is directly absorbed through the mucus membrane of the mouth. This delivery method helps to avoid the medication going through the digestive process. Troches are carefully prepared in compounding pharmacies to meet specific patient needs. How to Take a Troche? Place troche in mouth and gently push the troche as deep as it will go between the gum and cheek. The troche should stick to the gum or cheek. Do not swallow or chew the troche. It usually takes between 15-30 minutes for the troche to dissolve. 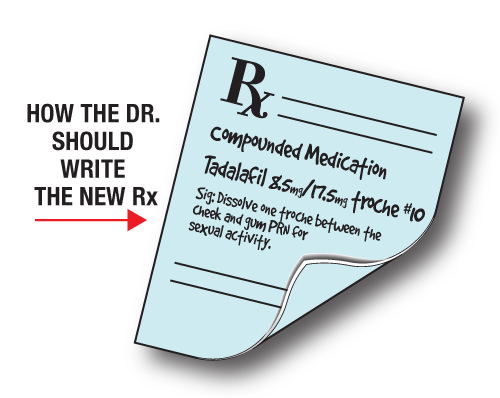 What’s the Difference Between Sildenafil and Tadalafil? Both Erectile Dysfunction medications are taken as needed for sexual activity and work within 30-60 minutes after taking. However, the difference between the two is how long the medication works in your body. Sildenafil lasts up to 4-6 hours and Tadalafil can last up to 36 hours in your system. Call 800-852-1445 and feel confident again! 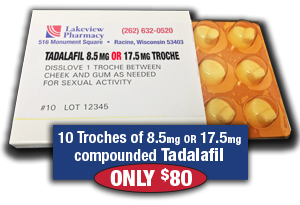 Ask your physician for a prescription of Tadalafil 8.5mg or 17.5mg Troches today. Click the graphic below to download an information sheet to take to your doctor. Shipping Policy: All packages are shipped and labeled “Priority Mail” using the United States Postal Service (USPS), with tracking available to the point of delivery. We do not require a signature for delivery and any package material marked “delivered” by the USPS is considered a successful delivery. We are NOT responsible for packages that have been lost or stolen after they have been successfully delivered. If your package has been lost, we can provide the tracking number upon request. All lost or stolen packages should be addressed by the consumer at their local US Post Office.